Alfie Evans father wants to 'build bridges' with Alder Hey hospital. 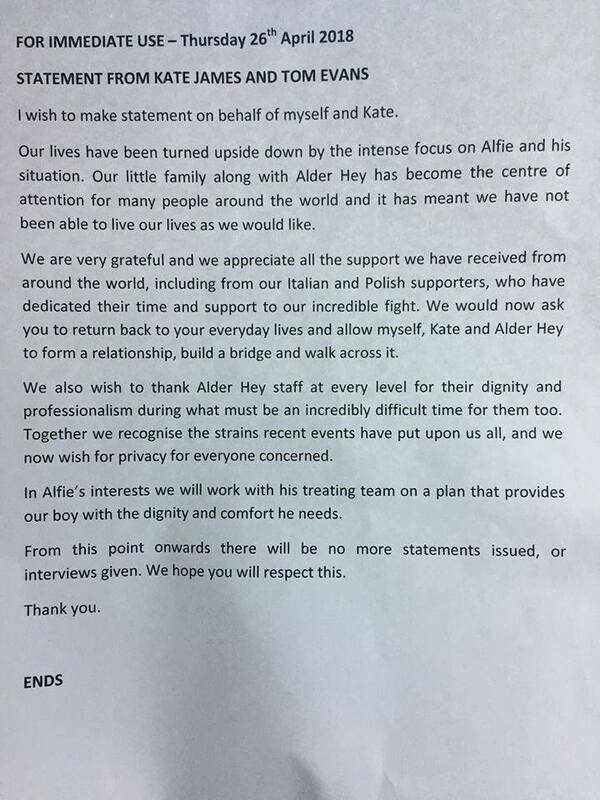 Some supporters of the family think this latest letter is an effort to bring Alfie home by pleasing the hospital. Alfie is currently still alive and receiving oxygen. He parents say he is doing well. Tom Evans says he wants to "build his relationship" with the hospital. Tom Evans, has been fighting to take his 23-month-old son out of Alder Hey Children's Hospital for months. He now asking to be "left alone". Tom thanked supporters Alfie's Army but asked them "to go home". Alfie's parents have lost every legal appeal to a High Court ruling in February allowing the hospital to switch off the toddler's ventilator. The toddler's life support was withdrawn on Monday. Mr. Evans delivered a statement outside Alder Hey after a meeting with doctors at the hospital. On behalf of himself and Alfie's mother, Kate James, he said: "Our lives have been turned upside down by the intense focus on Alfie and his situation. Our little family along with Alder Hey has become the centre of attention for many people around the world and it has meant we have not been able to live our lives as we would like." He continued, "We are very grateful and we appreciate all the support we have received from around the world, including from our Italian and Polish supporters, who have dedicated their time and support to our incredible fight. "We would now ask you to return back to your everyday lives and allow myself, Kate and Alder Hey to form a relationship, build a bridge and walk across it." He said: "Together we recognise the strains recent events have put upon us all and we now wish for privacy for everyone concerned. "In Alfie's interests we will work with his treatment team on a plan that provides our boy with the dignity and comfort he needs." He added there would be no more interviews given. The couple had expressed strong criticism of medical staff at Alder Hey during the legal proceedings. Mr Evans had suggested his son was a "prisoner" at the hospital to the European Court of Human Rights. He also suggested Alfie had been misdiagnosed. 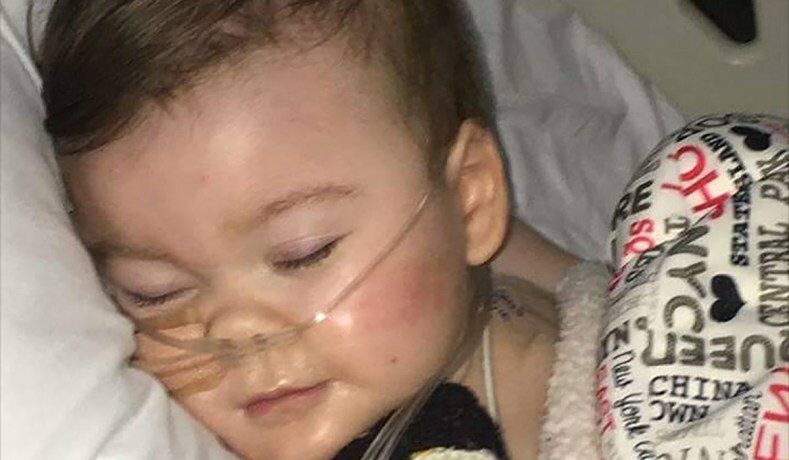 After a meeting with Pope Francis, Tom Evans and Kate James had hoped Alfie could be taken to the Vatican-linked Bambino Gesu Hospital in Rome. The hospital is complaining that their staff has been subject to "unprecedented personal abuse that has been hard to bear" from the supporters of Alfie gathered outside. A military air ambulance was on standby "at the request of the Pope". On Monday, the Italian government granted Alfie citizenship. Alfie, who has been diagnosed with a rare undiagnosed degenerative neurological condition. He has been in Alder Hey since December 2016. Alder Hey Hospital has been unavailable for comment.